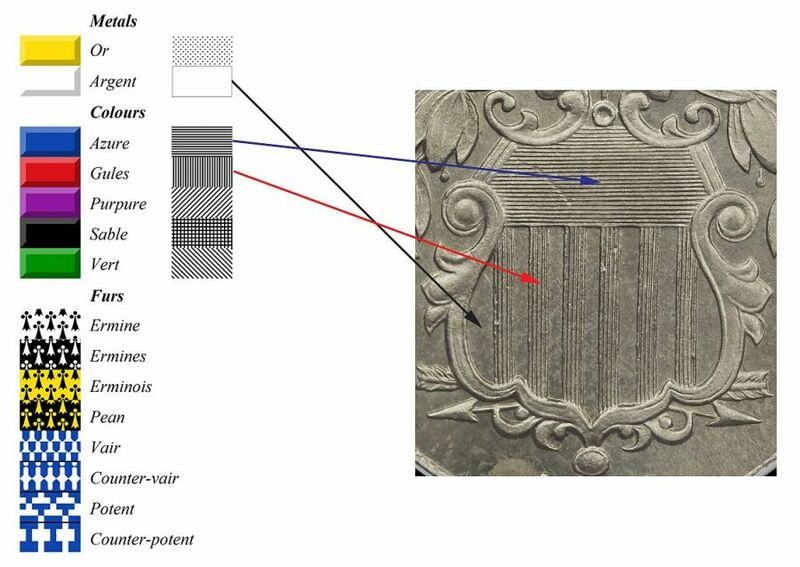 Have you ever looked at the shield on many of our 19th and 20th century coins and wondered what the lines across the top horizontal bar of our national shield represent? How about the lines on the vertical bars? Beyond the vertical bars representing the 13 original states holding up the single bar representing the federal government you may be surprised to find that the lines or the lack thereof on the bars are defined by certain colors in heraldry called tinctures. 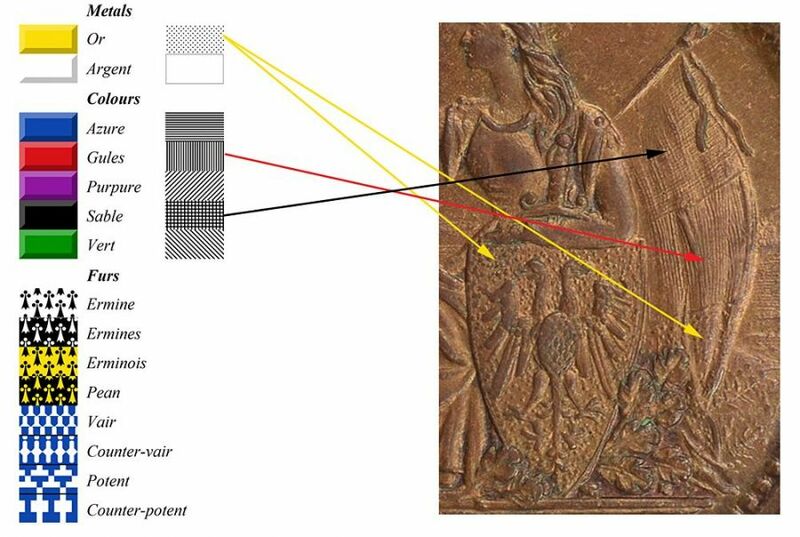 Tincture is a relatively small palette of colors used in heraldry dating back to 12th and 13th century Europe. These have been adapted to numismatic uses by certain patterns which represent the colors in heraldry. For instance, on the 1883 shield nickel I picture the horizontal lines across the top bar represent the color blue. The vertical bars with stripes represent the color red and the plain bars represent the color silver or white. 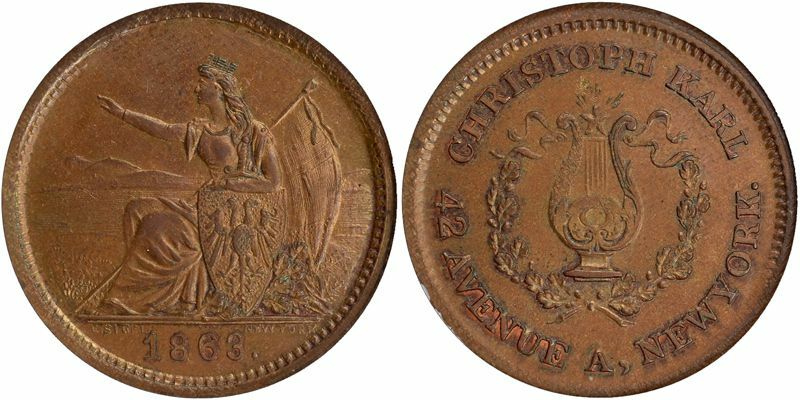 In my NGC seated imagery custom set, I have an MS-64 NY 1863 NEW YORK F-630AM-1a CHRISTOPH KARL token featuring a seated image of Germania. The image on the obverse of this token has been incorrectly identified by some as “Liberty”. However, by applying tincture in both the flag and the shield the seated image is clearly not Miss Liberty but in fact Germania. Apart from the tincture, Germania is wearing a mural crown. 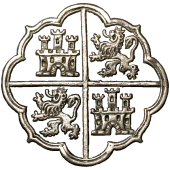 In the 19th century mural crowns were used primarily in Europe to represent republics or in the case of this token the German Confederation. Following the pattern of heraldry, the flag has the black, red, and yellow bars of the German Confederation. The only problem I have found in this flag are that the bars are vertical instead of horizontal as is the German Confederation flag. I googled this discrepancy for an explanation and found that the vertical bars were easier to see by the belligerents, both friend and foe on the field of battle. Another give-away that this token features Germania is the double-headed eagle of the German Confederation coat of arms in a field of yellow as defined by the pattern of the gold tincture. Next entry I've Wanted One of these for a Very Long Time! I find it interesting that the shield has 6 red and 7 white (silver) stripes, as opposed to our flag, which has 7 red and 6 white. Fascinating! Thanks for another great journal entry. I ran into some of this when I was researching coin descriptions for my Curacao/Suriname set. Your description here is one of the best summaries I’ve seen, and your diagrams are a great piece of reference material unto themselves. Thanks for posting.